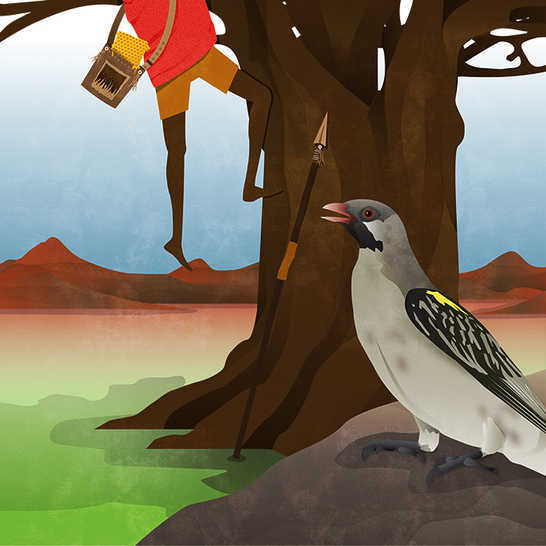 This is the story of Ngede, the Honeyguide, and a greedy young man named Gingile. 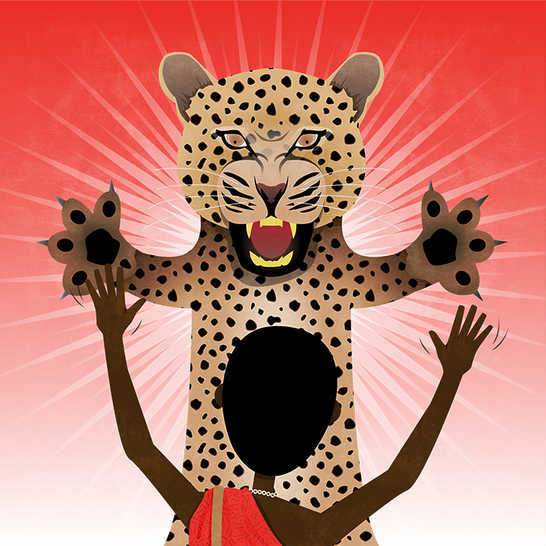 One day while Gingile was out hunting he heard the call of Ngede. Gingile’s mouth began to water at the thought of honey. He stopped and listened carefully, searching until he saw the bird in the branches above his head. “Chitik-chitik-chitik,” the little bird rattled, as he flew to the next tree, and the next. “Chitik, chitik, chitik,” he called, stopping from time to time to be sure that Gingile followed. 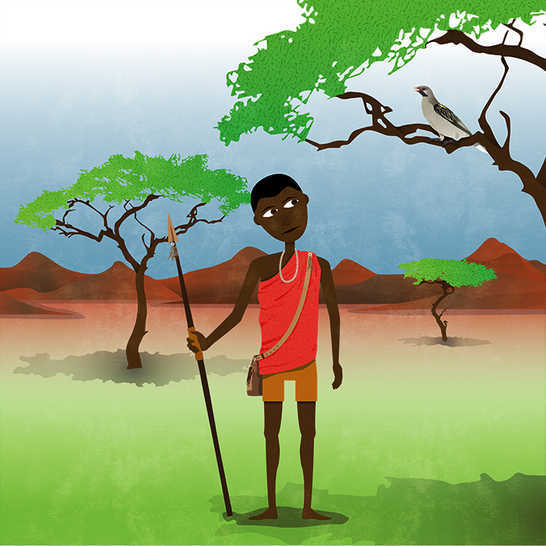 This is the story of Ngede, the Honeyguide, and a greedy young man named Gingile. One day while Gingile was out hunting he heard the call of Ngede. Gingile's mouth began to water at the thought of honey. He stopped and listened carefully, searching until he saw the bird in the branches above his head. "Chitik-chitik-chitik," the little bird rattled, as he flew to the next tree, and the next. "Chitik, chitik, chitik," he called, stopping from time to time to be sure that Gingile followed. Dis a di stuori bout Hngede di Onigaid bod, an wahn krievn yong man niem Gingiile. Wan die wail Gingiile did de out a ont im ier Hngede a mek naiz. Gingiile mout staat waata az im a tingk bout oni. Im stap an lisn gud, an a sorch so til im did si di bod pan di chrii lim uova im ed. "Chitik-chitik-chitik," di likl bod a shiek op imself, wail im a flai go uova di neks chrii, an di neks wan. "Chitik-chitik-chitik," im did a kaal an a stap nou an den fi mek shuor se dat Gingiile did a fala im. After half an hour, they reached a huge wild fig tree. Ngede hopped about madly among the branches. He then settled on one branch and cocked his head at Gingile as if to say, “Here it is! Come now! 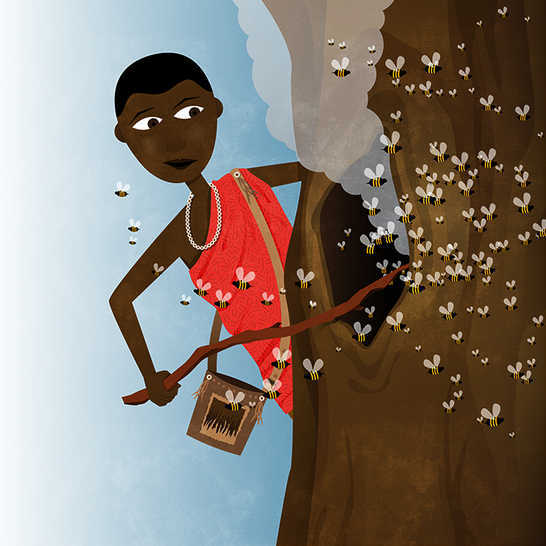 What is taking you so long?” Gingile couldn’t see any bees from under the tree, but he trusted Ngede. After half an hour, they reached a huge wild fig tree. Ngede hopped about madly among the branches. He then settled on one branch and cocked his head at Gingile as if to say, "Here it is! Come now! What is taking you so long?" 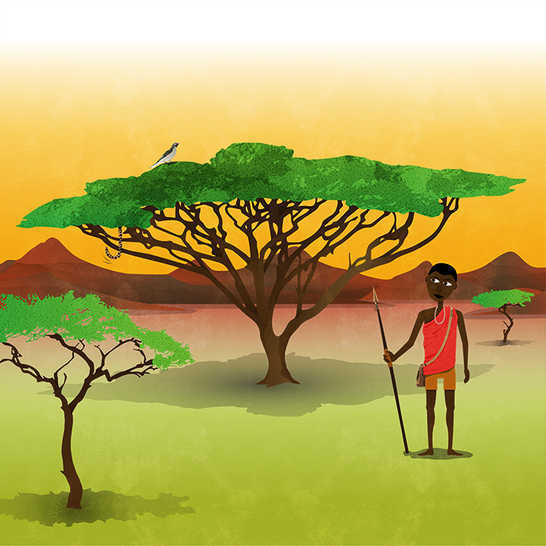 Gingile couldn't see any bees from under the tree, but he trusted Ngede. Afta aafan-owa, dem did riich wahn big wail fig chrii. Hngede a jomp op an dong laik im mad aal bout di chrii lim dem. Den im stap pan wahn lim an kak im ed tuwaadz Gingiile laik im a se, "Siit ya! Kom nou! Wa a tek yu so lang?" Gingiile kudn si no biiz fram anda di chrii, bot im did chos Hngede. 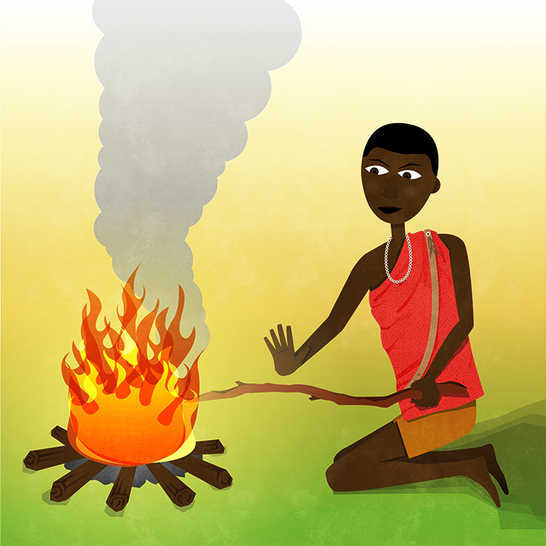 So Gingile put down his hunting spear under the tree, gathered some dry twigs and made a small fire. When the fire was burning well, he put a long dry stick into the heart of the fire. This wood was especially known to make lots of smoke while it burned. He began climbing, holding the cool end of the smoking stick in his teeth. So Gingiile pudong im ontin spier anda di chrii, gyada som jrai stik an kech op wahn sumaal faiya. Wen di faiya staat bon gud, im put wahn lang jrai stik inna di migl a di faiya. Di ud di nuon espeshali fi mek op uol iip a sumuok wen it a bon. Im staat klaim, a uol aan pan di kuul en a di stik we a sumuok wid im tiit. Soon he could hear the loud buzzing of the busy bees. They were coming in and out of a hollow in the tree trunk – their hive. When Gingile reached the hive he pushed the smoking end of the stick into the hollow. The bees came rushing out, angry and mean. They flew away because they didn’t like the smoke – but not before they had given Gingile some painful stings! Soon he could hear the loud buzzing of the busy bees. They were coming in and out of a hollow in the tree trunk – their hive. When Gingile reached the hive he pushed the smoking end of the stick into the hollow. The bees came rushing out, angry and mean. They flew away because they didn't like the smoke – but not before they had given Gingile some painful stings! Likl afta dat im kuda ier di bizi biiz dem a boz loud. Dem did a go in an out a wahn uol inna di chrii chonk – dem aiv. Wen Gingiile riich di aiv im push di en a di stik wid di sumuok pan it inna di uol. Di biiz dem rosh kom out, mad an beks. Dem flai we bikaaz dem neva laik di sumuok – bot nat bifuor dem gi Gingiile som at sting! When the bees were out, Gingile pushed his hands into the nest. 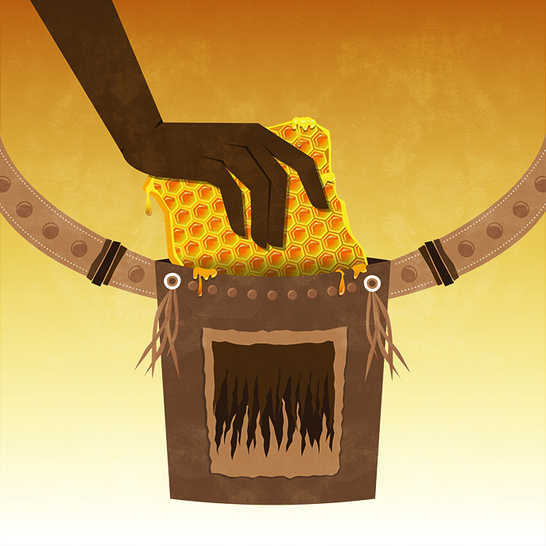 He took out handfuls of the heavy comb, dripping with rich honey and full of fat, white grubs. He put the comb carefully in the pouch he carried on his shoulder, and started to climb down the tree. Wen di biiz dem kom out, Gingiile push im an dem inna di nes. Im tek out som anfol a wieti onikuom, a jrip wid rich oni an fol a fat, wait bruud. Im put di kuom gud-gud inna di pouch we im did a kyari pan im shoulda, an staat klaim dong di chrii. Ngede eagerly watched everything that Gingile was doing. 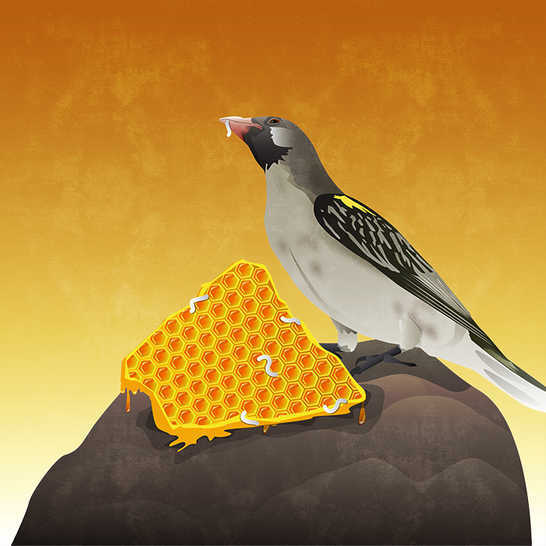 He was waiting for him to leave a fat piece of honeycomb as a thank-you offering to the Honeyguide. Ngede flittered from branch to branch, closer and closer to the ground. Finally Gingile reached the bottom of the tree. Ngede perched on a rock near the boy and waited for his reward. Hngede did ankshos a wach evriting we Gingiile did a du. Im did a wiet fi im lef a fat piis a onikuom az a tangk yuu prezent fi di Onigaid. Hngede jomp fram lim tu lim, niera an niera tu di grong. Fainali Gingiile riich di batam a di chrii. Hngede siddong pan wahn rak stuon nier di bwaai pikni an a wiet fi im riwaad. But, Gingile put out the fire, picked up his spear and started walking home, ignoring the bird. Ngede called out angrily, “VIC-torr! VIC-torrr!” Gingile stopped, stared at the little bird and laughed aloud. “You want some honey, do you, my friend? Ha! But I did all the work, and got all the stings. Why should I share any of this lovely honey with you?” Then he walked off. Ngede was furious! This was no way to treat him! But he would get his revenge. But, Gingile put out the fire, picked up his spear and started walking home, ignoring the bird. Ngede called out angrily, "VIC-torr! VIC-torrr!" Gingile stopped, stared at the little bird and laughed aloud. "You want some honey, do you, my friend? Ha! But I did all the work, and got all the stings. Why should I share any of this lovely honey with you?" Then he walked off. Ngede was furious! This was no way to treat him! But he would get his revenge. Bot, Gingiile out di faiya, pik op im spier an staat waak go a im yaad, an naa pie di bod no main. Hngede baal out mad-mad, "Viktaa! Viktaa!" Gingiile stap, an luk pan di likl bod an bos out a loud laaf. "Yu waahn som oni, iihn, mi fren? Ha! Bot a mi du aal a di wok, an get aal a di sting dem. Wa mek mi shuda shier non a dis nais oni wid yu?" Den im waak aaf. Hngede did wel beks! Dis a no no wie fi chriit im! Bot im wuda av im rivenj. One day several weeks later Gingile again heard the honey call of Ngede. He remembered the delicious honey, and eagerly followed the bird once again. 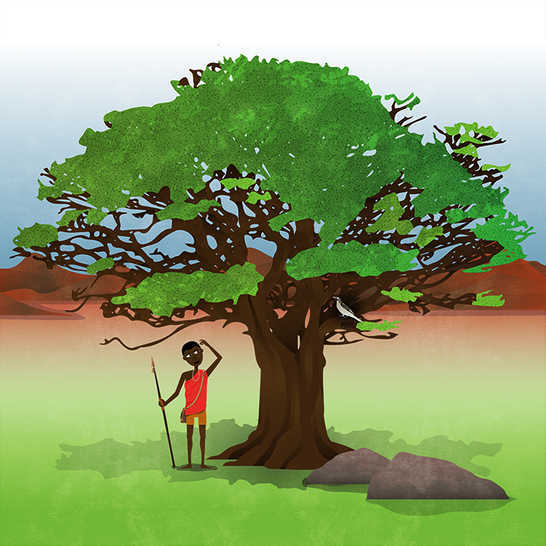 After leading Gingile along the edge of the forest, Ngede stopped to rest in a great umbrella thorn. “Ahh,” thought Gingile. “The hive must be in this tree.” He quickly made his small fire and began to climb, the smoking branch in his teeth. Ngede sat and watched. One day several weeks later Gingile again heard the honey call of Ngede. He remembered the delicious honey, and eagerly followed the bird once again. After leading Gingile along the edge of the forest, Ngede stopped to rest in a great umbrella thorn. "Ahh," thought Gingile. "The hive must be in this tree." He quickly made his small fire and began to climb, the smoking branch in his teeth. Ngede sat and watched. Wan die bout kopl wiik afta Gingiile ier di oni kaal fram Hngede. Im memba di nais tiesin oni, an ori op an fala di bod agen. Afta im liid Gingiile schriet pan di ej a di faris, Hngede stap an res anda wahn big ambrela maka chrii. "Aaa," Gingiile tingk tu imself. "Di aiv mos de inna di chrii." Im ori op an kech wahn sumaal faiya an staat klaim, wid di lim we a sumuok inna im tiit. Hngede siddong an did a wach. Gingile climbed, wondering why he didn’t hear the usual buzzing. “Perhaps the hive is deep in the tree,” he thought to himself. He pulled himself up another branch. But instead of the hive, he was staring into the face of a leopard! Leopard was very angry at having her sleep so rudely interrupted. She narrowed her eyes, opened her mouth to reveal her very large and very sharp teeth. Gingile climbed, wondering why he didn't hear the usual buzzing. "Perhaps the hive is deep in the tree," he thought to himself. He pulled himself up another branch. But instead of the hive, he was staring into the face of a leopard! Leopard was very angry at having her sleep so rudely interrupted. She narrowed her eyes, opened her mouth to reveal her very large and very sharp teeth. Gingiile did a klaim, an a wanda wai im no ier di yuuzhal boz. "Miebi di aiv did de diip inna di chrii," im tingk tu imself. Im jrag imself op pan aneda lim. Bot insted a di aiv, im did a luk schriet inna wahn lepad fies! Lepad did wel beks kaaz ar sliip get badli distorb. Shi skwiiz ar yai dem tugeda, uopm ar mout an shuo ar big-big an wel shaap tiit dem. Before Leopard could take a swipe at Gingile, he rushed down the tree. In his hurry he missed a branch, and landed with a heavy thud on the ground twisting his ankle. He hobbled off as fast as he could. Luckily for him, Leopard was still too sleepy to chase him. Ngede, the Honeyguide, had his revenge. And Gingile learned his lesson. Bifuor Lepad kuda lik aafa Gingiile, im ori op dong di chrii. Inna im ori im mis a lim, an jrap wid a loud naiz pan di grong an twis im angkl. Im limp aaf az faas az im kud. Loki fiim, Lepad did tuu sliipi fi ron im dong. Hngede, di Onigaid get im rivenj. An Gingiile did lorn im lesn. 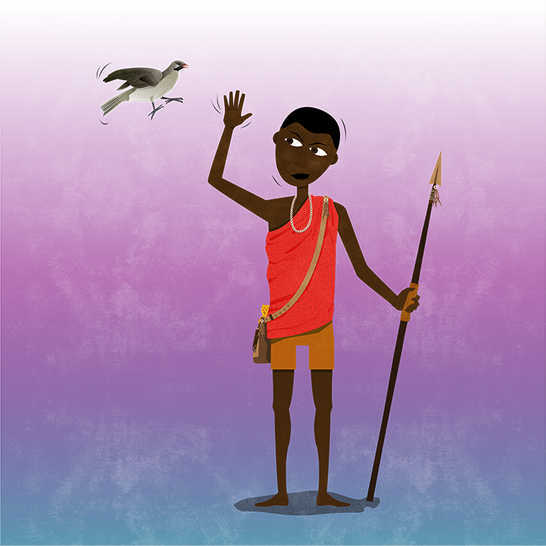 And so, when the children of Gingile hear the story of Ngede they have respect for the little bird. Whenever they harvest honey, they make sure to leave the biggest part of the comb for Honeyguide! So, wen Gingiile pikni dem ier di stuori bout Hngede dem av rispek fi di likl bod. Enitaim dem riip oni, dem mek shuor se dem lef di bigis paat a di onikuom fi di Onigaid!